The United Nations has initiatives to recognize people of African Descent which started in 2015 and go until 2024. This includes all people who were affected by the Slave Trade. Populations in major countries in South and North America as well as the islands and adjoining countries like Mexico. This article about Marielle will hopefully offer a connection with mutual struggles and challenges for people of African Descent in and outside of the contiguous United States and its provinces and detached states. Marielle as Afro-Brazilian came from the very community she knew, loved and fought for on the national stage. Marielle Franco was also called a ‘Black Human Rights Activist’. As council person she represented residents of Rio De Janeiro. 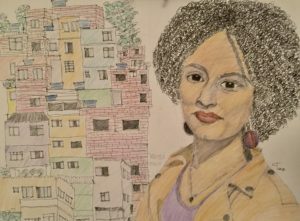 She had ambitions, as a civil society activist, and according the ‘NPR’ article campaigned ‘against lethal methods routinely used by security forces with the city’s poorest neighborhoods’. As ‘a wave of anger and indignation on social media and protests in the streets’, according to the NPR article, her legacy is of a ‘charismatic young woman with a one record of championing social causes in a metropolis plagued by issues of violence, race, and poverty’. I learned about her on the day of her funeral when several thousands of people some with signs saying, “How many more have to die?” Does this sound familiar ? The obvious answer is from the USA Black Community and the another from Student protests over gun laws. She was shot ‘returning from an event to empowering black women in Brazil, a cause she passionately championed’. (NPR article) Given the civilian casualties, in 2017 of 6,731 and in one month at 2018 649, included people killed during police operations. The president of Brazil recently gave military jurisdiction over security in the state of Rio De Janeiro. Marielle spoke out about more violence, blaming recent homicides (shockingly two youths killed and thrown in the gutter) on the police while declaring the ‘military police unit’ as “the battalion of death’ based on number of civilians shot by its officers. “The poor people are black,” he said. “The worst opportunities are for blacks. The worst schools are in the black neighborhoods (shanty towns) or in favelas.” according to a visiting Brazilian speaking to the St. Louis American Newspaper. Her positions as a feminist, leader of anti-racist movement and inequality drew mainly the middle class while the poor needed more engagement. She was born in a shanty town grew up with more freedom in the 80’s then her people now have present day Brazil 2018. As a mother of an eighteen year old daughter, she was persistent, achieving her masters in public administration. Her life causes and death had reached the many thousands of people who poured into the streets protesting her ‘assassination’. The crosshairs of police brutality, gang control of ‘shanty towns’, and crackdown on violence turned over to the military made the focus of protest against violence a dilemma for a young leader caught in the cross fire. The St. Louis American newspaper article also quoted the visiting Brazilian as saying that his country had more mixed race couples but was also more segregated than the states. Some writers on her loss wrote about hopelessness for Black People in Brazil. She will not be forgotten.